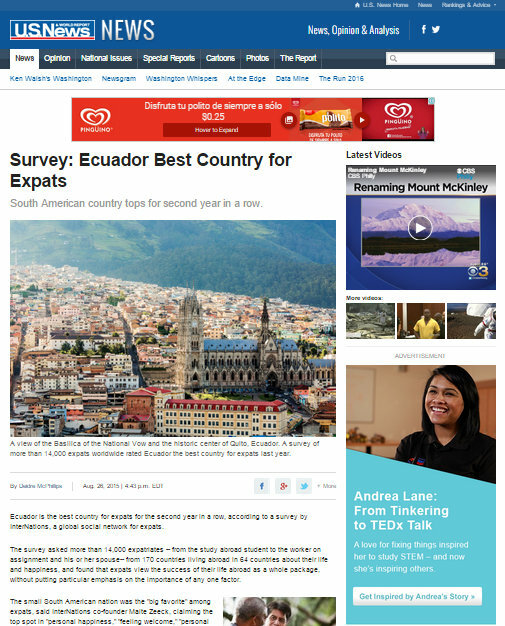 The U.S. News & World Report ran an article on August 26, 2015 reporting that according to a survey of 14,000 expats in 64 countries, Ecuador topped the list of best countries to live in as an expat. This is the 2nd year that Ecuador made the number 1 spot. Click HERE to read the article. As full time expats first coming to Ecuador in 2005 and then running a business and raising a family here since 2010, Tom and I have a pretty well-rounded perspective of life here on the coast of Ecuador. We can attest that, in our own experiences, Ecuador deserves high marks for these subcategories. We have witnessed many clients who arrive here in fairly poor health and often stretched to the limit with stress, that, a year or so later, are hardly recognizable to their former selves, having lost a considerable amount of weight and donning flip flops, a golden tan, and a relaxed smile. The caveat? Ecuador may well score high on these kinds of surveys, but there is absolutely no guarantee that relocating to Ecuador be will be the solution to your problems. We have seen firsthand that this is especially true for those expats who come here strictly seeking a lower cost of living. If you tend to be more of an optimist you will see the smiling, welcoming faces as you wave. You will see families laughing and playing volleyball or soccer together at the end of the day. You will notice the lack of beggars (at least here on the coast) despite there being evident poverty. You will see a gorgeous coastline with warm water and breathtaking sunsets. You will quickly make friends who welcome you, arms wide open, to dinner in their home at a moment’s notice. If you tend to be more of a pessimist, you can be in the exact same time and space and experience an entirely different reality. You will see what you perceive as poor people lounging about in hammocks in front of their unfinished shack-like homes. You will see trash. You will see countless dogs roaming the streets and notice with alarm men walking around town with machetes in hand. If you do not tend to trust people, you will be suspicious, questioning people’s motives for being friendly to you. You will focus on the lack of efficiency, how “they” do “everything” here backwards compared to where you are from. Speaking of which, an article came out yesterday in Cuenca High Life that provoked considerable commentary from its readers, entitled “The Arrogant Expat: Let me tell you how we do things in the USA.” Important Note: If you come to Ecuador and attempt to change what you perceive to be wrong with it, you will drive yourself crazy. In the U.S. there is a culture of becoming snide, loud, and even threatening towards employees in an attempt to get them to affect whatever it is that you want/need done. In Ecuador, this approach will not work. It will back-fire and they will simply move on to the next person in line (believe me, I ashamedly admit that I learned this early on firsthand). Instead, try to befriend and empower people whose assistance you are seeking. Ask calmly and with a [genuine] smile if there’s anything they might possibly be able to do to assist with the situation. While not foolproof, it’s amazing the difference it can make. When facing a frustrating, mind-numbingly “illogical” situation (and there will be many! ), instead of banging your head against a brick wall, try your best to reflect upon the experience as an opportunity to strengthen your patience “muscle.” (Think how strong you’ll get to be after a year or so-Yay!). Our friend Kris used to refer to our province of Manabí as “mañana-bí.” And there is the famous saying here that mañana doesn’t necessarily mean tomorrow (or even next week, for that matter). Always try to find the humor in the situation and with yourself. It just makes life easier that way. Consider the possibility that there might actually be logic behind what you perceive as illogical or a faulty way of doing something. A classic example we often use to illustrate this point is getting the bill at a restaurant. Newbies to Ecuador are quick to complain that the server never brings them the check. They are unaware that it is considered rude here to “rush” clientele out of the restaurant. When you are ready to leave, you simply request the bill. (And even then, it might take a while to get the check. And then they might not have change for your $20 so they’ll have to send their 10 year old son out to go find you change). Remember, you’re building your patience muscle! While some of our clients have thrived as coastal Ecuador expats, there are others for whom Ecuador simply wasn’t a good match, high expat survey scores notwithstanding. Some arrived here and immediately did an about-face because their Ecuador experience did not match their expectations. 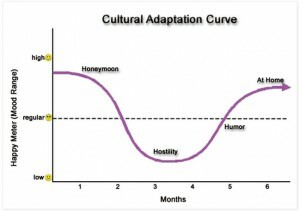 Then there are others who, like most of us, first delighted in Ecuador (the “honeymoon phase” of the widely accepted “stages of cultural adaptation“). Four proposed stages of cultural adaptation (image taken from this site). I would venture to say that the realistic length of time for adapting is more like a year or two for most Ecuador expats. 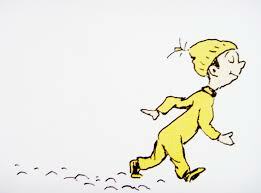 During the honeymoon phase, newcomers appreciate and even celebrate the myriad differences in culture, food, and can find the humor in not being about to communicate well in the local language, at waking up at 4am to the crowing of a rooster in the city, or not being able to find products they were used to having back home. However, as time passes, the honeymoon inevitably comes to a crashing halt and a new stage begins. Now the focus becomes disproportionately on what is wrong, instead of what is good and new. For some, this so-called “hostility stage” is but a passing phase as they continue to move through the ups and downs of adapting to a new culture and life. Those who eventually adapt arrive at a middle of the road experience where they generally accept and enjoy their new life. That is not to say there are no longer challenges, delays, or frustrations. But by now they have learned to better navigate the obstacles and move on. There are others, however, who may stay stuck in the “hostility” phase. Their negative perception of their reality can become further compounded if they have already sold or moved everything they previously owned, cannot afford to return, and now feel trapped in a place where they are just as unhappy (or more so) than they were before relocating. (3) Expect that, like anywhere in the world, you will face many unexpected challenges, especially as you are adapt culturally. Try your best to embrace the inevitable hurdles as they arrive and view them as opportunities for growth.